As I've mentioned before, there are four fantastic new stamp sets that will be released on July 1st (which is tomorrow, yeah!) 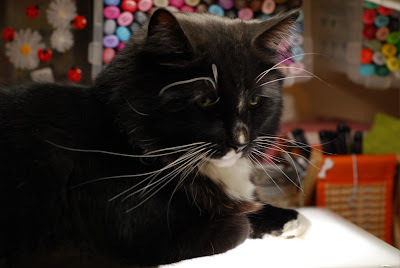 at The Craft's Meow and today we are showcasing Baggin' Some Rays. 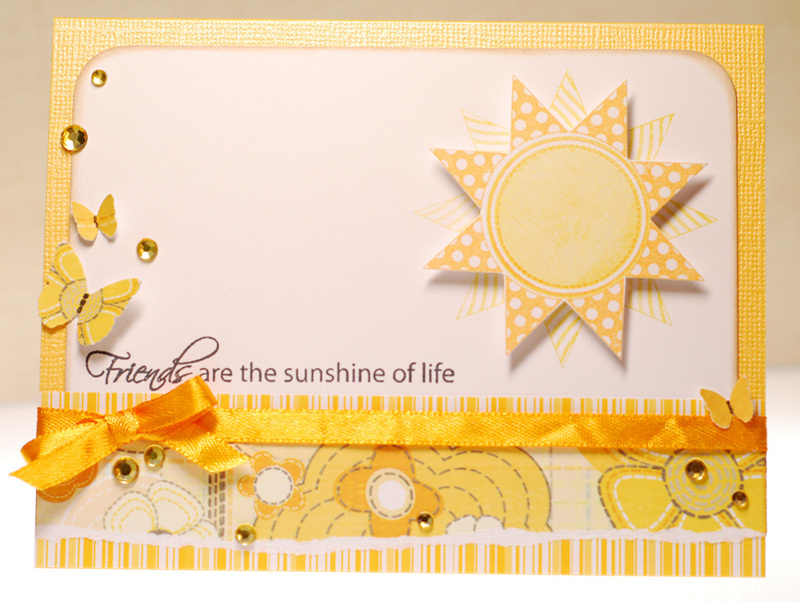 This is another set designed by Nina B Designs for TCM and all of the images are created for you to mix and match and build your own sunshiny image! There are also plenty of beautiful sentiments included that tie in perfectly with the sunshine theme but can also be used with loads of other images too. "Holy sun rays Batman... she didn't use any Copics!" There are no fancy stamping techniques or anything but I didn't need them because I let the mix and match capabilities of this set do all of the work for me. Then I just did some fussy cutting and relied on my monochromatic color scheme to pull this card together. I think this card is sure to bring a smile to someone's face, don't you? Now what would new release festivities be without chances to win prizes? Yep, Lisa will draw THREE of you to win Baggin' Some Rays... one from each of three of the design team and friends blogs. For a complete list of who's got sneak peeks just check out the TCM blog. You'll have until 10:00 pm Pacific tonight to make the rounds and leave comments and Lisa will announce the winners in tomorrow's post... which also happens to be a fun blog hop celebrating the release so don't miss that! There are four fantastic new stamp sets that will be released on July 1st at The Craft's Meow and today we are showcasing It's a Banner Day. 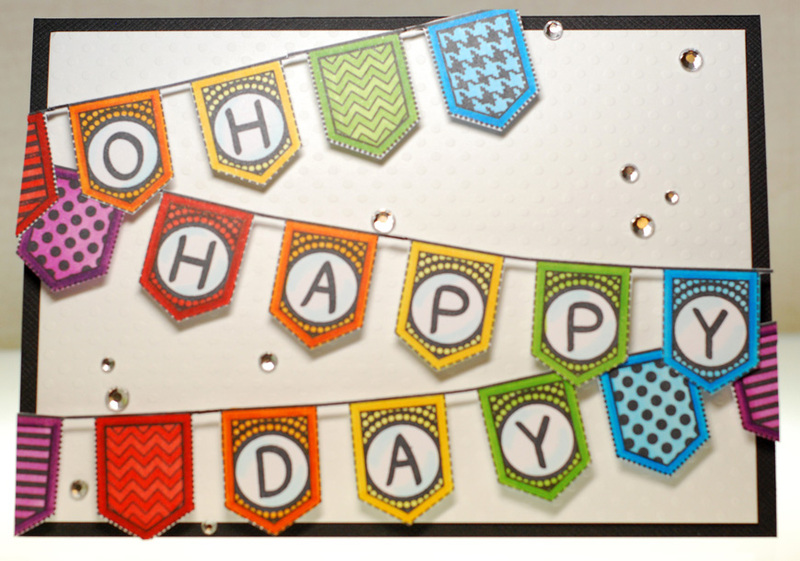 This set not only creates those cool pennant backgrounds that are oh so popular right now... but it also allows you to create your own decorative and personalized sentiments which is awesome! Now what would new release festivities be without chances to win prizes? Yep, Lisa will draw THREE of you to win It's a Banner Day... one from each of three of the design team and friends blogs. For a complete list of who's got sneak peeks just check out the TCM blog. You'll have until 10:00 pm Pacific tonight to make the rounds and leave comments and Lisa will announce the winners in tomorrow's post! There are four fantastic new stamp sets that will be released on July 1st at The Craft's Meow and today we are showcasing Life is a Carnival. 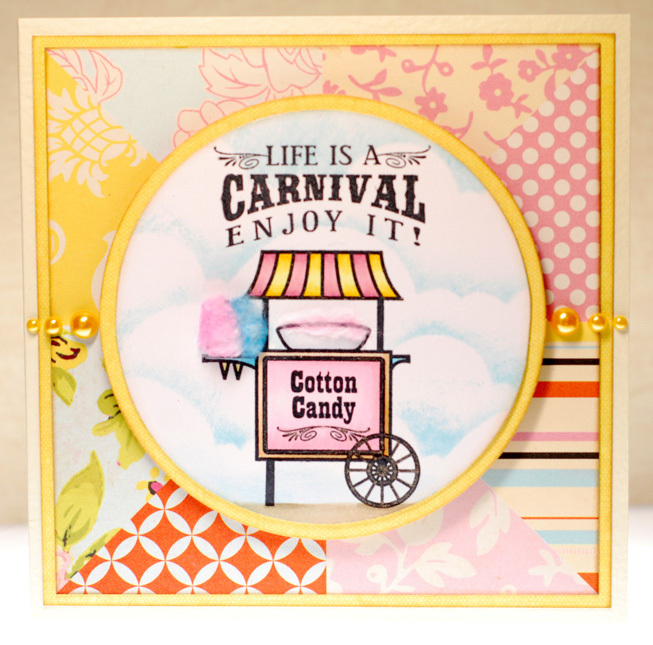 This set is sure to take you for a ride with all of it's whimsical carnival inspired images and sentiments! Once they were dry, I simply glued the colored fluff onto the cones of the stamped image to give it some fun dimension and texture. And I didn't stop there, I also took an extra strand of pink that I had left over and glued it to the top of the little heated pan that they spin the sugar in. Tsk, tsk Mr. Cotton Candy vendor... he really should clean his equipment better, LOL! 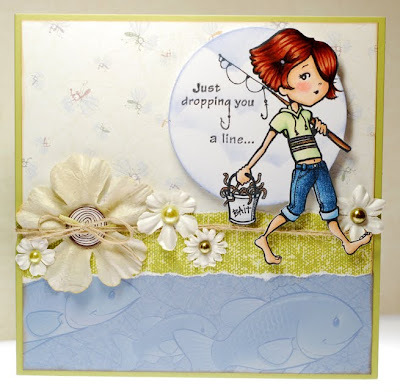 I also used my Distress Inks to create the cloudy sky background again and since I have been getting asked quite often how I create that look, I've now got a quick video on YouTube that you can check out and see just how easy it is to do. Hope you enjoy it! Now what would new release festivities be without chances to win prizes? 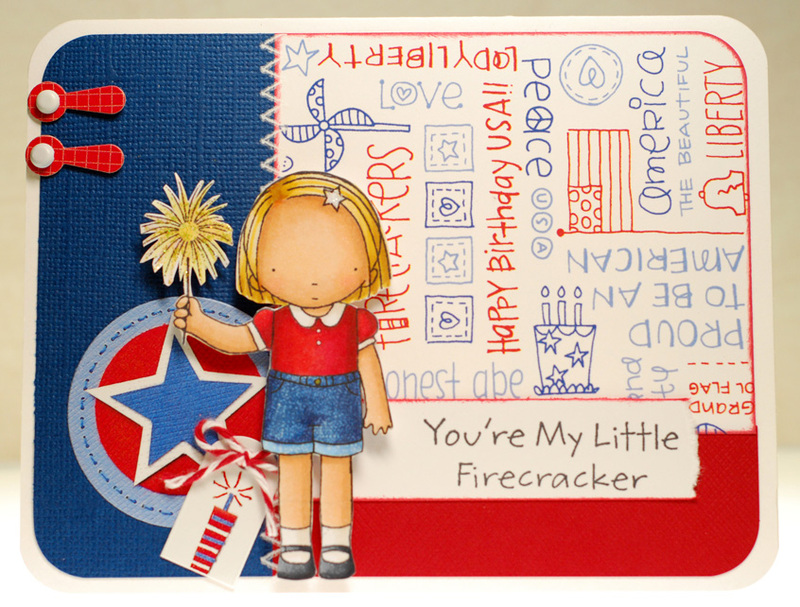 Yep, Lisa will draw THREE of you to win Life is a Carnival... one from each of three of the design team and friends blogs. For a complete list of who's got sneak peeks just check out the TCM blog. You'll have until 10:00 pm Pacific tonight to make the rounds and leave comments and Lisa will announce the winners in tomorrow's post! Can I just tell ya that I'm tickled to have been asked by Lisa to be a Friend of The Craft's Meow for July?! 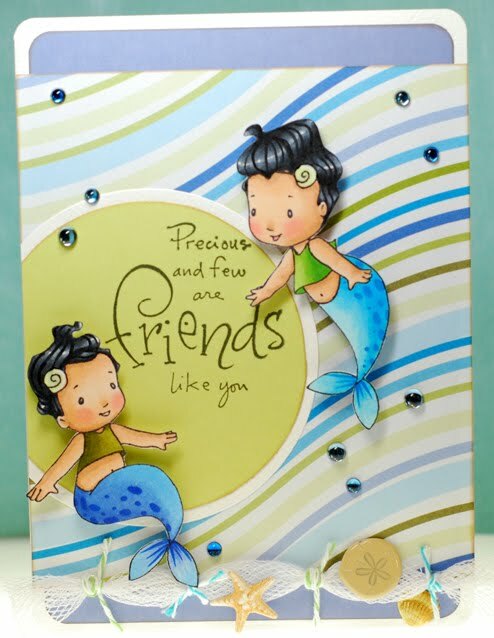 Oh yea, I'm totally excited to join Lisa and her fab team this month and we are kicking off previews of the four fantastic new stamp sets that will be released July 1st at The Craft's Meow! 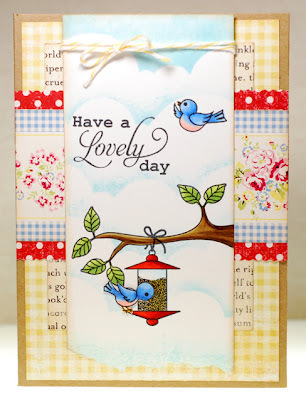 Today we are showcasing Lovely Birds, a super "tweet" stamp set designed by Nina B Designs for The Craft's Meow. Now what would new release festivities be without chances to win prizes? Yep, Lisa will draw THREE of you to win Lovely Birds... one from each of three of the design team and friends blogs. For a complete list of who's got sneak peeks just check out the TCM blog. You'll have until 10:00 pm Pacific tonight to make the rounds and leave comments. We'll announce the winners in tomorrow's post. Ok, I'm a working girl again today so I'll see ya later with something fun and kinda different for me! I skipped (with my high speed I can skip, hop and jump now... LOL) on over to the Farm Fresh challenge blog for some inspiration and found a sketch by Rachel that was right up my alley. 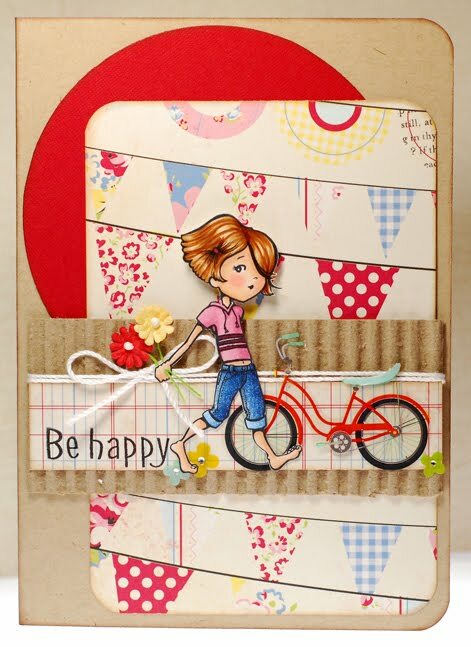 At first I was having a hard time choosing a stamp but when I spotted the Sunshine Broadcast paper pad on my desk it was a no-brainer that Cheeky Beach was the perfect fit for this card. 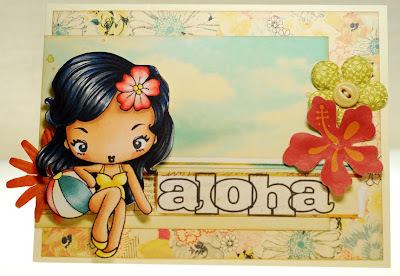 Talk about a match made in heaven... the papers have a cool desaturated color palette that kinda reminds me of an old post card from Hawaii and that is totally the world I saw this little wahine living in. So I colored her up in similar tones and followed the sketch pretty faithfully from there. Sure I made one of the horizontal strips much thinner than the other and added a few flowers here and there but following that layout made this one nice and quick! One down... only five or so more to go... LOL! Zip! Zoom! Whoa... did you see that? So if you would like a chance at winning this week's prize then why not play along? 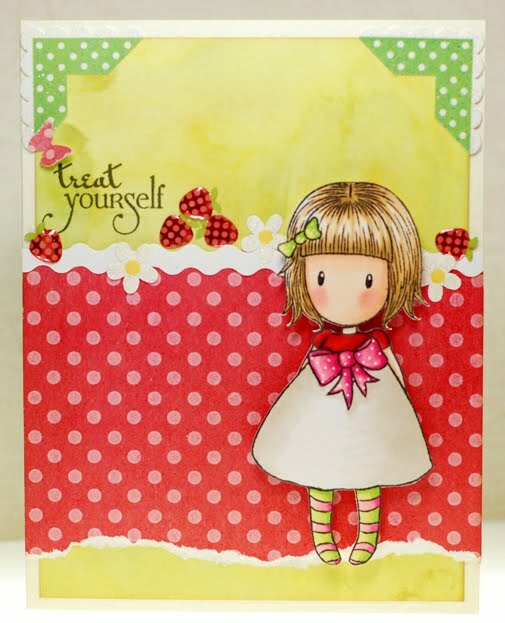 Don't forget that your card must feature a Tickled Pink stamp in order to qualify for the prize... these include: Lil Lolitas and Lads, Pinkettes, Pink Pets and Cherries. All of which can be found in the Tickled Pink store. Ok, so I know you want to play along right? 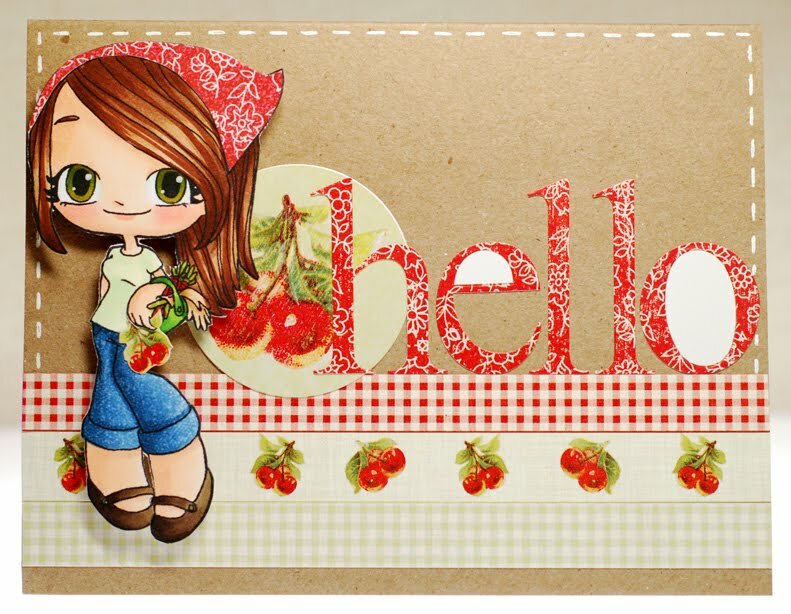 Of course you do, because every week there is a new and exciting prize being offered and in order to be eligible to win just be sure that your project includes a stamp that is sold in the All That Scraps store. Whether it is any of our wonderful in house designs or from the various other stamp companies that ATS carries, the choice is yours. Then be sure to link up your creation with Mr Linky by next Tuesday at 10pm est and only one entry per person please! Well, I hope your morning is off to a great start with plenty of sunshine to brighten your day! 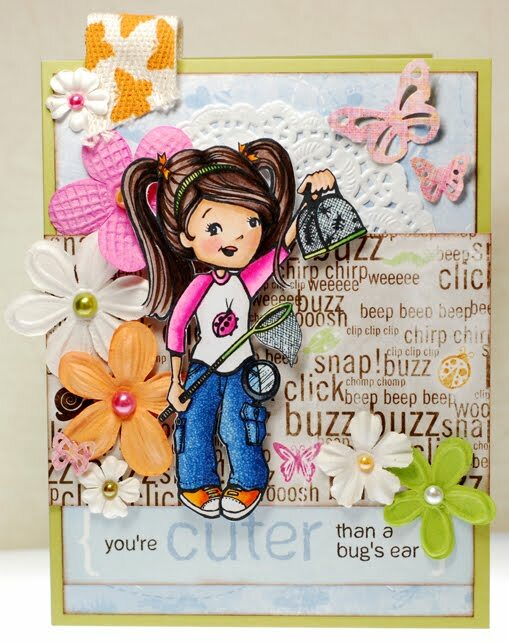 You can check out more sweet CC Designs cards on the ATS blog today and all of the new June stamps are now available here! Well, it's off to work I go... thanks for stopping by! Looking at it now on the computer screen, the green photo corner stickers don't look like they coordinate at all but in real life I swear they look much better, LOL! Well, that's all I've got for today... love ya later! The flowers and gems were a no brainer based off the pics but I also added the bit of tulle as a nod to the tutus which I think is kinda clever. I think this is a nice mix of super girlie but with some spunky attitude thrown in. Okay then, thanks for stopping by and I'll see ya in 24! Alrighty, best for me to get going with my day... have a great one! So last week we had a color challenge at ATS and I said those were one of my fave kinds of challenges, which is true, but this week we've got a challenge that I love even more... a photo inspiration challenge! Lesa has a fab home decor photo for us to play off of and interpret any way we like on our cards or projects. I tend to use the photo's color scheme as my jumping off point and pull papers that have a similar vibe, which is exactly what I did on my card for today. 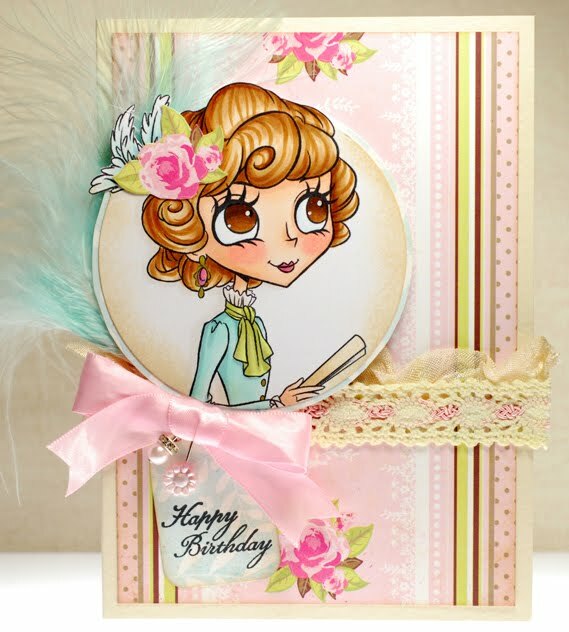 Luckily I still had this Vintage Whimsy paper on my desk from a previous card and all I needed to add to that was a shot of light green to get a look close to the inspiration's. 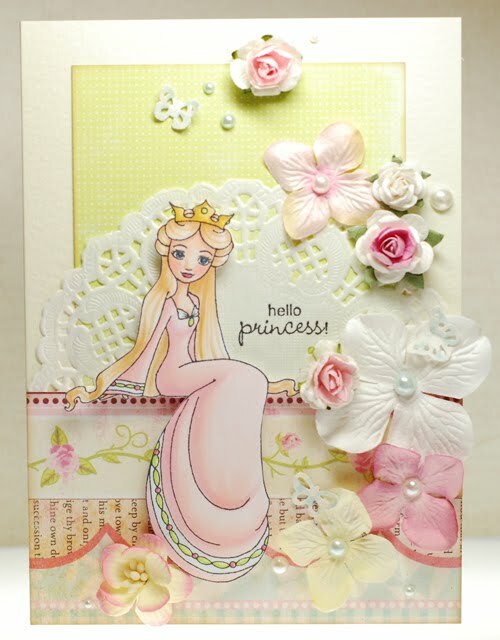 Because the colors and patterns were so super girlie I went straight to the Sweet November Princesses and thought that Arabella would be the perfect fit. My second bit of inspiration came from the vase of mixed flowers in the photo... I decided to follow suit and add a variety of different flower styles and sizes to embellish Arabella's pretty spring-like home. And just like that I had a finished card! So we've got a Review Preview of the Sweet November June release over on the ATS blog today and any excuse to ink up these new merbabies is A-Ok in my book. When I was drawing these characters I couldn't help but be inspired by my childhood memories of a cartoon/live action movie called "The Water Babies". They weren't merbabies with tails but they did live under the sea and this boy falls into the water and turns into a cartoon who then meets the Water Babies. I saw this when I was very young, probably about four or five, and for years after I would still hum the 'I coca lorem' song from it and I always hoped that when swimming in the lake I would see a Water Baby or two. I built it up in my mind as being one of the best shows ever so a few years ago I found a VHS copy of it on ebay and I had to get it. OMG I should have left it to my memories because man was that show awful! LOL! The animation was just dreadful and the storyline was painful to sit through. I really couldn't understand why I had loved it so much as a kid. But as bad as I now know it to be I do have to give it credit for sparking my imagination at such a young age. The rest is finished off with some shell and starfish shaped brads and some old gelly gems that I found floating around in my gem drawer. I really managed to shop my stash with this card and that, my friends, is a good thing. You can check out more fab Sweet November cards on the ATS blog today and all of the new stamps are now available here! For my card I took Dressy Miss Anya's body and replaced her head with Love Miss Anya's beautiful bright eyed face. It was such a simple swap but I love that this is an easy way to give my new Miss Anya open eyes without having to wipe away ink and trace in new eyes using the light box. 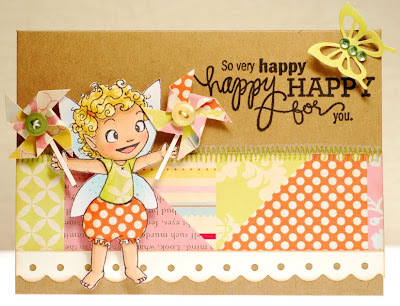 And doesn't she look right at home perched on that sentiment strip... such a cutie! It's a Tom Boy Pinkette hop! Then once you have finished hopping don't forget that all of the new stamps are now available in the Tickled Pink store. And not only can you get them in rubber but Kellie has also made the entire month of June a digi month so you can get them that way for a little instant gratification! Now let me send you on your way as Angela is the next blog that you'll want to be sure and visit today. 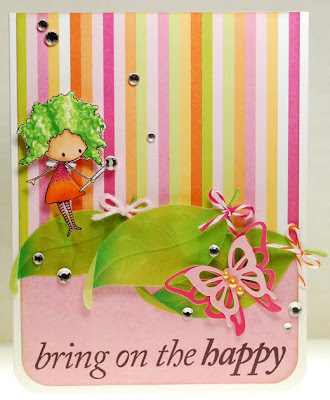 If you ever get lost just reference back to the complete hop list at the Tickled Pink blog and don't forget to leave a comment there as well telling us which of these new stamps is your fave of the release and why... we would love to know! There will be a blog hop celebrating the release of all 6 new stamps on Monday the 13th Aussie time (tomorrow for us here in the States) which is also when you will be able to get your very own Pinkettes from the Tickled Pink store! As always it wouldn't be a Tickled Pink Stamps preview without a prize, so head on over to the Tickled Pink blog and leave a comment on today's post for a chance at winning your very own Fishing Audrey rubber stamp! 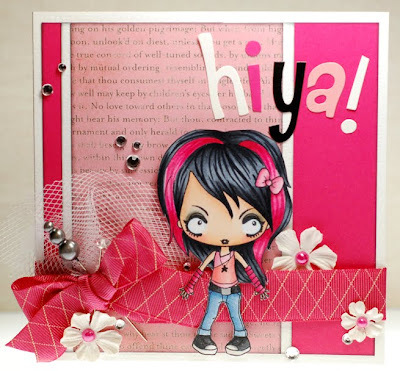 While you are there be sure to check out all of the fantastic cards that my fellow Pink Ladies and the Pinkette team have created with her as well! We've got some candy winners! Salt water candy is back!